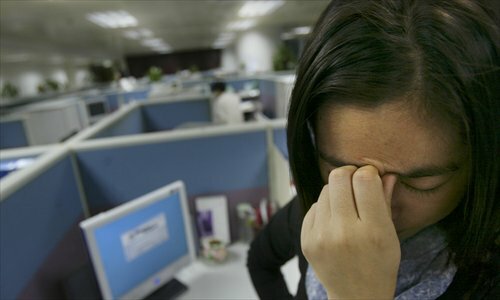 Women in Anhui Province can take 1-2 days off when suffering menstrual pain so long as they provide a medical certificate, according to the latest labor regulations established by the Anhui provincial government. Anhui is not the only province to take this stance. Other regions, such as Jiangsu Province and Guangdong Province, are also looking to implement similar regulations. As someone who suffers from serious menstrual pain, I really appreciate it when companies allow their female employees to rest during their periods. Actually, these types of regulations are nothing new. There is actually a similar national level regulation that allows women a day off during their periods, but this is only for those women working in specific physical labor jobs. This leaves women in other industries out in the cold. A study by The University of Bath in April of 2014 found that menstrual pain affected women's cognitive performance when it comes to concentrating and multi-tasking, and that the impact of pain can be widespread. For me, I find it difficult to think or remember things when things get too painful, let alone write something. How much pain can a period cause? It is different for different people. Even the same person can experience different levels of pain from month to month, some times hurting worse than other times. It's difficult to explain to someone who has never suffered from it, including men and some lucky women, but it really happens. In my case, besides severe cramps in my lower abdomen, I also suffer from nausea, dizziness and frequent vomiting. I don't dare eat anything because even just the smell of food can make me throw up. This problem makes it hard for me to find relief through traditional Chinese means such as brown sugar water or ginger tea. Sometimes I even end up throwing up any pain killers I take. For the most part, the only thing I can usually do is hold onto a hot-water bottle and curl up in a ball waiting for the pain to disappear. On a 1-10 pain scale, if a shot at the doctor's is a 3 and getting a tooth pulled is a 5, then my period is a 7. The pain usually comes on the first day of my period and lasts anywhere from half to an entire day. Most of my female family members suffer from serious menstrual pain. My cousin once fainted at work from her pain while working as a flight attendant. She needs to inject pain killers sometimes just to get through a flight. "Why don't you go to the hospital?" This is one of the most frequent questions I get. Actually I have gone to the hospital. When I was middle school, I went to a Western hospital and a traditional Chinese hospital asking for help. However, examinations showed that my womb was quite normal. I've tried herbal medicine like primrose oil. However, these are more likely to just provide psychological comfort, sometimes relieving my pain a little bit, but they don't really work over the long term. Doctors comforted me with the fact that this pain would not last my entire life. It's supposed to get easier when I get older or after I give birth. However, this is cold comfort for me now. Just arranging time for a break can be a battle. Although I have vacation days, it's difficult to ask for leave beforehand. Although periods are a cycle, it's difficult to be precise about the date as timing can be influenced by a number of factors. Adding to the difficulty is the fact that not every woman suffers from such intense pain. This makes it difficult to prove to some people that I'm not pretending to be miserable. It was extremely embarrassing when my male manager asked me to show him a doctor's note when I took a sick day, which requires that I go to a hospital. Since my pain typically only lasts no more than an entire day, usually the best plan of action is to just stay at home after taking a pain killer rather than take a bus to the hospital so I can stand in a long line just to ask a doctor for a note proving I'm in pain. Fortunately, the regulations proposed by Guangdong Province say that medical certificates for pain will be valid for 6 months. This is sure to make things a bit more humane. Another issue is that periods are a rather private things. Most women I know don't want everyone in the office to know when their periods have started as it can be rather embarrassing. Many women are just too shy to even mention it. Usually the only thing you can do is hope you have an understanding boss who won't push the issue with you and will give you a day (or half-day) off, or you just have to have that day deducted from your salary. While these laws sound good for me because I'm already employed I do worry about the discrimination they might bring. Imagine if I had to change jobs. As HR compares me to a man with similar education and work experience they would probably choose the man because they know he won't have to take 12 days off a year for menstrual pain. It's already very tough for women in the workplace due to existing discrimination. Women have to prove that they are far better than other male applicants just to get their foot in the door. So I worry that while this law is looking out for the rights of female workers, it can also have a negative impact. All in all though these kinds of protections are needed. However, we also have to change people's perceptions. More people need to understand that menstrual pain does not mean a woman is not working hard or that she is a poor employee, they just need more understanding.